If you want to experience the real beauty of Kerala make the road trip between Kannur and Wayanad through verdant forest. You'll not be disappointed, as the journey offers travellers an exhilarating experience of nature at its best. Someone once asked us, "Don't you plan your holiday?" It appeared a weird question – our holidays never seemed unplanned to us. We probably put more thought into our travel plans than anyone else. We chalk out road maps, our stays, the time we'd travel etc. We discover much more than the average traveller and are in total control of our holidays! We go on road trips, which are so much fun; we are at freedom to stretch the holiday at our convenience - take the road well travelled or get adventurous and go on a journey that promises excitement, new sights and sounds. We are free to change our travel plans mid-way, without giving a thought to bookings and cancellations. We halt on highways to watch farmers tilling their fields, we watch migratory birds coming into nest, we look for pieces of history that's not mentioned in tour guides. What we don't do is keep track of time or check rail or flight schedules. Believe me, it's a fun way to travel through the country. We've enjoyed all our road trips, but a trip that stands out in terms of sheer natural beauty the journey offered was the drive from Kannur to Wayanad. The raw beauty left us mesmerized. This was a few years back - we were on one of our road trips, travelling through the most picturesque lands in Kerala. To say, Kerala is breathtakingly beautiful would be an understatement. To me it was paradise on earth – the freshest of air, lush greenery everywhere, deep ravines covered with fluffy clouds, wildlife cutting across our path, calm seas and pristine beaches, backwaters and houseboats, swaying palms, friendly people, coffee, tea, pepper, coconut, banana and pineapple plantations, scrumptious sea-food, the kallu aka toddy and rabbit meat at a roadside eatery - I can go on. I realize this is going to sound cliché, but Kerala amazed me. My family and I had not expected to find so much diversity in nature, in such close proximity to each other. Each new destination had newer experiences in store for us. We'd been on the road for 13 days, and were on the last leg of our trip - heading from Kannur to Wayanad. 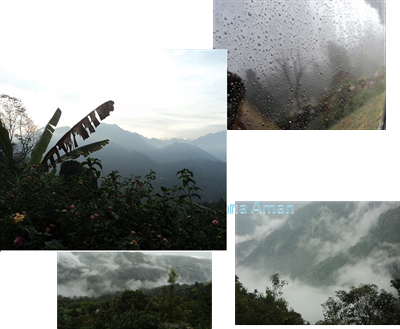 We spent a night at a homestay in Kannur and the people there suggested us many routes to take to Wayanad. But, we stressed on a scenic and exhilarating route, so they recommended we go via Kuthuparamba and Nidumpoil. It was a state highway for the most part of the journey; the ride wasn't smooth, but the scenery more than made up for the bad road. (I hear the road is much better now). We set out early as we always do, so we have time on our hands. The drive through partially hilly terrain (ghat road) was approximately 125 kilometres and we'd have reached Wayanad within a couple of hours. But, we like to stop en route and/or take detours to make the most of our journey. We did the same on this trip too and a journey of 2½ hours took us close to 7 hours. The winding roads took us through pockets of thick fog that would engulf us one minute and disappear into thin air (quite literally) the next. We were probably driving through clouds, not fog. If I had my way I'd have set up a tent and lived on those roads for the rest of my life. The journey was as much part of our holiday, as the intended destination. 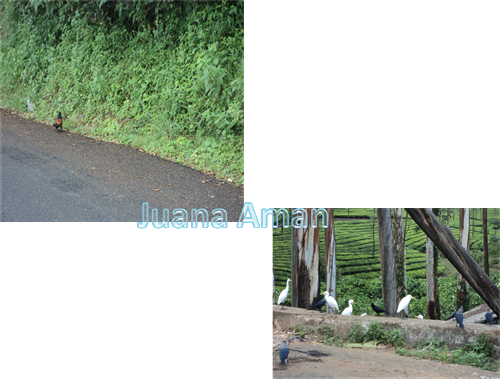 The scenic beauty on the hilly terrain had us so engrossed that we lost count of the number of hairpin bends we encountered. Dense fog left water droplets on the windows and windscreen of our car. The crisp, fresh air filled our nostrils and lungs as we rolled down the windows. We stopped on the lay-bys to soak in the sheer beauty of nature. The high-pitched musical calls of the birds, the sudden rustling of branches above us, left us enchanted. The latter signified we were in monkey territory. Tribes of monkeys swung through the high branches above us, watching us intently. We caught a glimpse of a few birds, but the camera-shy creatures were hard to capture; though we were lucky to catch a greater coucal hopping on the edge of the road. We also spotted a flock of crows and egrets as we neared Wayanad. The starkness of their black and white feathers was hard to miss and made quite a contrast to all the greenery around. You can pull alongside roadside shacks for steaming hot cups of sweet tea and biscuits. Surprisingly, there were quite a few to be found on the lonely stretch. Some will sell you local fruits and deep fried snacks as well. Banasura Sagar earth dam in Wayanad is another tourist place that is gaining more attention. We were on 'watch', driving slowly, peering into the thicket all along the drive on the hill highway for animals, birds, wildflowers, you name it. 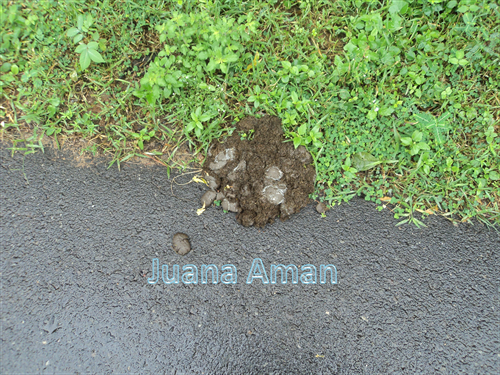 There was fresh dung (yes, you read that right) by the side of a road, we missed an elephant herd by a few minutes. Our excitement over elephant poop and a wild one at that seems comical now, but when you have only wilderness for the company such a sight is thrilling. A herd had probably just crossed that way, leaving behind a trail of fresh poop. Crossing through a verdant forest that human's hadn't contaminated was a surreal experience; not one that city dweller's can fathom. 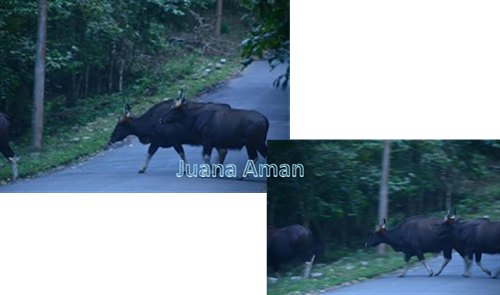 Imagine having a herd of wild gaur suddenly crossing your path, on a highway. There were about 15 of these magnificent animals, with their characteristic white legs trudging across the road. We managed to capture a few of them on the camera. 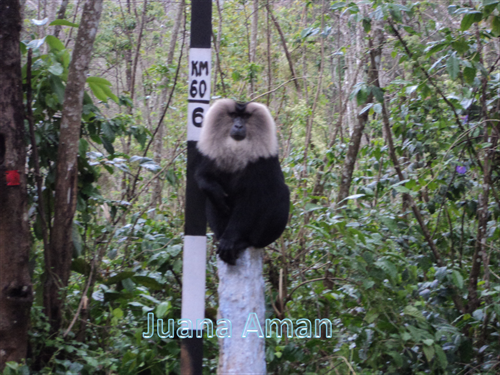 The excitement didn't end there for we also spotted a wild lion-tailed macaque sitting on a post by the roadside. The handsome creature posed for us –sitting on his 'high throne', looking regal, with the forest behind him, as his kingdom. We drove on to find and soon the tall trees and dense underbrush were left behind and we were looking at a new landscape. A panorama speckled with tea plantations that went up and down like dunes. There was a carpet of green as far as the eyes could see and we realized we had entered Wayanad. 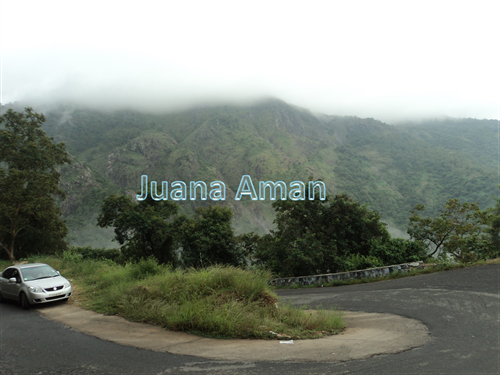 Wayanad was another exhilarating experience, more on that in my next post. Also, check out the budget resorts in Wayanad.